balcony providing view of Sound in addition to the Gulf of Mexico. New carpet. New a/c-heating system. Cable TV in all bedrooms and in living room. Separate shower and Jacuzzi tub in master bathroom. Exercise room on first floor of condo building. Swimming pools and hot tubs. Heated pool available in winter months. 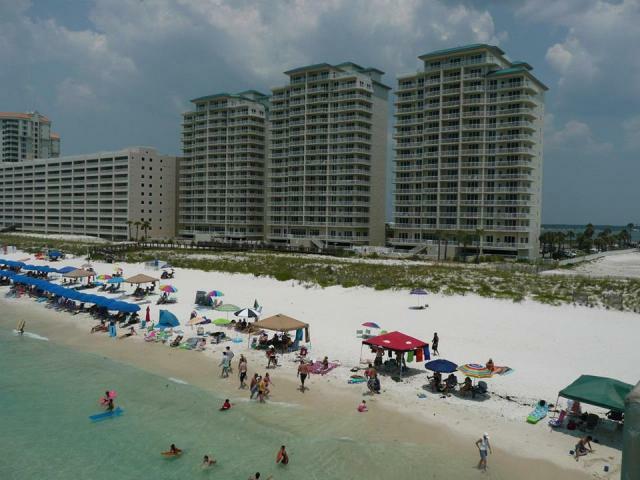 This condo overlooks the beautiful Gulf of Mexico. White, sandy beaches with walkway down to beach. Close to the Navarre Beach pier. October 1 - April 30:  Off season rate is $1,500.00 for 7 nights. May 1 - September 30:  Summer rate is $2,625.00 for 7 nights. There is also a $200.00 refundable damage deposit. Weekly rentals only. These rates include cleaning and a 12% sales/tourist tax. Confirmation of Rental Arrangements Agreement. Please send email with questions concerning rate.